CCQ holds an Annual Sale to raise funds for our program. 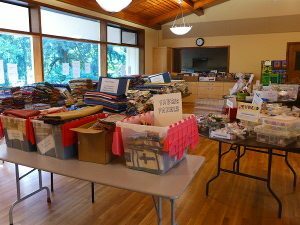 The sale includes fabric, thread, quilting/sewing notions, sewing machines, quilt kits, patterns, books, magazines — all donated by CCQ supporters. Volunteers work throughout the year, sorting donations. Much of it goes into our stash for students’ use in the prison quilting program. The excess is set aside for our Annual Sale. Our first couple of sales were held in the fall or winter in Yamhill. In more recent years, we’ve held them in late spring or early summer in Wilsonville. We usually set the date for the next sale around six months in advance and publicize it on our website and Facebook page. Please contact us if you have any questions about the Coffee Creek Quilters Annual Sale.